If you look at the central dot and move your head away from the monitor, the rings will start to move. Now slowly approach the monitor and the rings will start moving in the opposite direction. This classic illusion was called after Ludimar Hermann who discovered it in 1870. All of the places where white lines cross seem to our eyes as grey blurs. But if you look directly to one of the crossings, the blur will dissapear. Look at this picture carefully for about half a minute without moving your eyes; eventually, the picture will start to vanish. This is a variation of a Troxler effect which states that if you fix your vision to specific points, the surrounding picture will gradually dissapear. This triangle was named after a psychologist Gaetan Kanizsa who first described its effect. 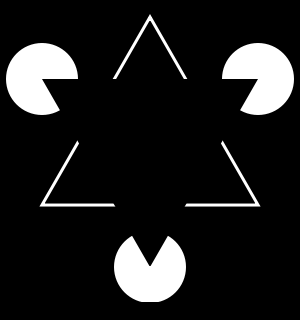 When you look at the picture, your brain creates frames of the triangle even though they do not exist. Also known as “Poiuyt” or Devil’s fork, this famous illusion shows an impossible object. Two rectangular legs on one side are tranformed into three cylindric legs on the other side. This illusion can be found in almost all psychological textbooks in the world. Two monsters on this picture are actually of the same size. However, our brain automatically adjusts pictures which are further away and thus the farther monster seems bigger. It got its name after Robert Jasrtow in 1889. The lower figure seems bigger, although both figures are of the same same. 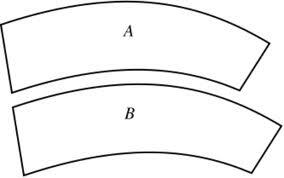 The shorter side of figure “A” is placed next to the longer side of figure “B”, so we get the wrong illusion. It was first described by a British psychologist James Fraser in 1908. 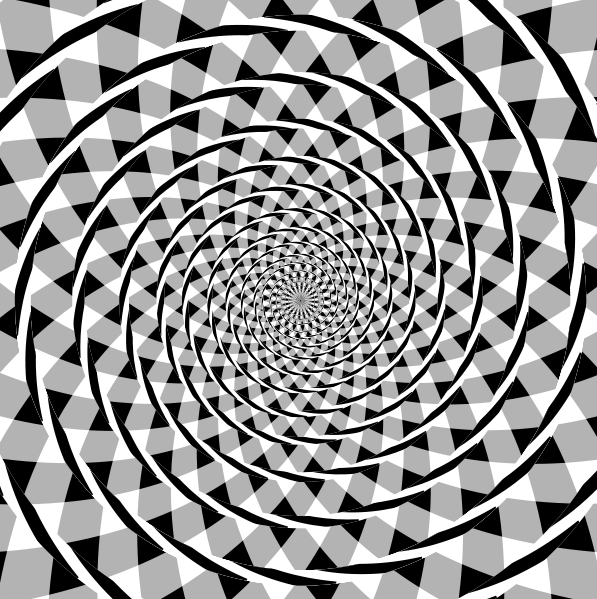 The illusion is also known as a fake spiral. It may seem that arches are overlapping and making an infinite spiral, but it is just a series of concentric circles. This is a variation of a Hermann grid where black dots appear and dissapear on the sections of grey lines. Interestingly, if you bend your head at the 45 degrees angle, you get a weaker effect but it is not eliminated. There are several variations, but the effect is always the same. “Blue” and “green” backgrounds are actually of the same color. Feel free to open it up in Photoshop and make sure for yourself. Penrose triangle is a well-known graphical paradox. It shows three beams, combined at the right angle, but they still make a triangle. It obviously breaks some rules of geometry, which for one thing states that all angles in a triangle make up for a total od 180 degrees. Look at the centre of the image for about 30 sec. Then look into the distance, desirably to a white are like a wall or ceiling. What do you see? Named after Johann Karl Friedrich Zollner. 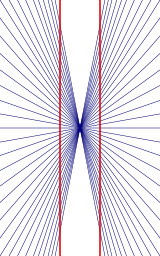 It consists of paralel lines which do not look quite paralel to the observer. But if you take a ruler, you can see for yourselves that it’s true. Although these two red lines look bent, they are actually perfectly straight and paralel. 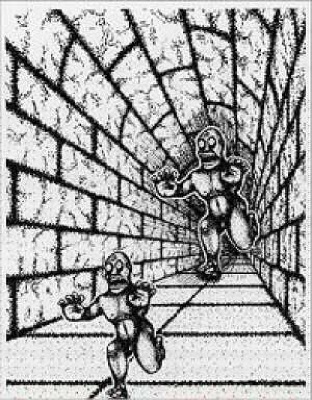 This illusion is credited to Ewald Hering. 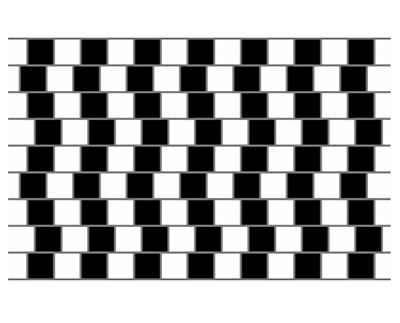 Also known as Ebbinghaus illusion and it is still discussed what causes this effect. Nevertheless, the orange circle on the left side seems smaller than the one on the right side – but, of course, they are of the same size. Yes, the leaning tower in Pisa is really leaning, but these two images are actually the same. The right tower being leaning is just an illusion. Try to make the same thing with any other tall building, you’ll get the same effect. Created by a web designer Nobuyuki Kayahara. It is special because some people see the siluete rotating clockwise, and other counter clockwise. What do you see? Even though it is obvious that the rectangulars moving up and down are actually in the same horizontal position, our brain is assured that they should be moving to the right. It does not seem quite special at first, but if you move your look over the image, you’ll notice that the squares will start rotating. But, as soon as you focus your look to just one point on the image, rotation will stop. No, this is not an animated image. It is really static. You can notice this when you look at one dot and then the movements will stop. This illusion was made with the help of the color contrast and the position of the shapes inside the picture. Also known as a pac-man illusion. If you look closely into the cross placed in the middle of the image, you will start seeing a green disc circling on the pink discs. After a few seconds, the pink discs will start to vanish and you will be left with a green disc circling around the middle cross. Do not move your look from the cross. This famous illusion was found on the wall of one coffee shop. It may not seem like that, but the lines on this image are really paralel. Notice the black frame around the image. It is actually straight ut so far the scientists have no explanation for this newest discovery. 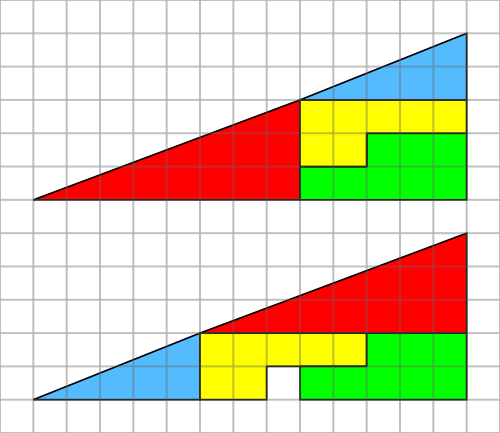 Although both triangles are comprised of exactly the same parts, the second triangle is missing a piece. The author of this magic triangle is Paul Curry, and the explanation lies in the fact that neither of these big triangles are not right angle triangles because they have curved hypothenuses.